The Renault 8 was launched in 1962 and was one of the French marques new small family saloons. It succeeded the very successful Renault Dauphine which shared many of its mechanics and wheelbase with the R8. Power was supplied by a 1100cc engine which produced around 45BHP with a three or four speed manual sending power to the rear wheels. The new Renault 8 proved a fun car to drive with its light body and flickable handling making them excellent cars to drift round corners. However its tiny rear engine was short on power. In 1964 Renault upped the game by releasing the Renault 8 Gordini. 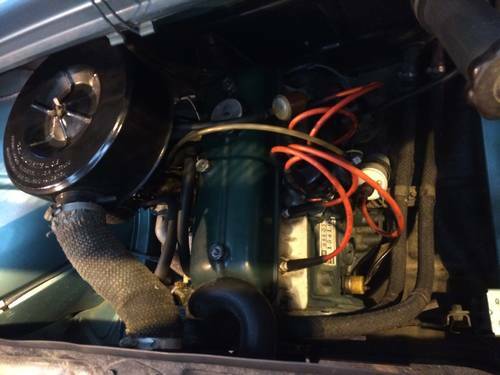 It featured an enhanced 1108 cc engine, with power output increased to a huge 90BHP through the use of a cross-flow cylinder head and twin twin-choke side-draft Solex carb. The increase in power coupled with a lowered suspension and a four speed manual transmission, was a superb move turning it into an exciting and somewhat mad rally car. Thankfully all round disc brakes were still standard helping the little French rocket saloon reign in all that power. Production of the mad Renault 8 Gordini came to an end in 1970 with over 12,000 produced. 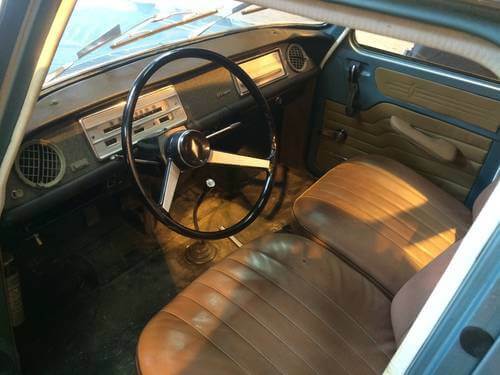 The Renault 8 Gordini on offer is a 1964 and is said to have been in storage for thirteen years. 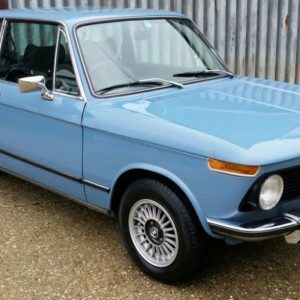 Very little information is given other than to state that it is in genuine condition and runs like a dream. The seller notes that the brakes will need attention. The Renault 8 is a car with a face. A very quirky face that makes people smile. It does look to be in good condition. The interior looks nice and clean. Not too many luxuries in here. The engine bay is a bit dark but it looks to be complete. Its hard to tell from the photos or the small amount of information given whether this is a genuine Renault 8 Gordini or not. The photos do suggest it is in good clean condition with the paint work giving off a nice shine and the panels looking relatively straight. The one photo of the interior shows it to be in good order with evidence of a little mark on the drivers seat. Its hard to make out other details however. The shot of the engine bay is quite dark so again its hard to really see a lot of detail but it looks clean. 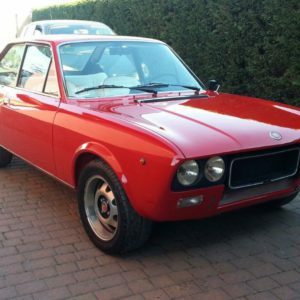 Mentioning the name Renault and Gordini in the same sentence always catches our attention and this listing, despite the lack of details and small number of photos, has definitely caught ours. Original Gordini’s were shipped in blue with white stripes and sported quad headlights and spot lamps. This one is blue but lacks the stripes and only has twin headlights. Also according to the DVLA it has a 1200cc engine and not an 1108cc. It’s possible it had a replacement engine at some stage in its life. So the chances are this isn’t a Gordini 8. 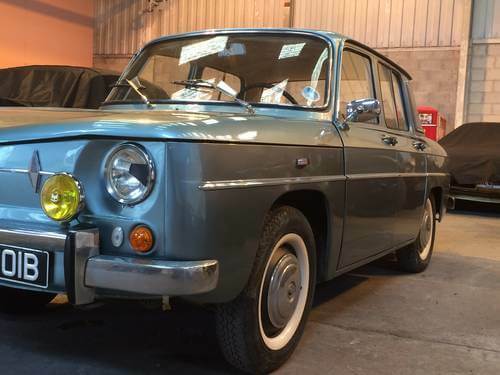 At £3,000 however this Renault 8 Gordini could be worth a look. If it turns out to be a genuine one then you could be in for a lot fun for not a huge amount of money. Assuming of course its not rotten. As we all know 1960s French cars like to rust so hopefully this one isn’t hiding any. We love the quirky looks of the Renault 8 and that dash of Gordini magic makes them all the more special. We’d love to blast this one round some twisty country lanes, after fixing the brakes. 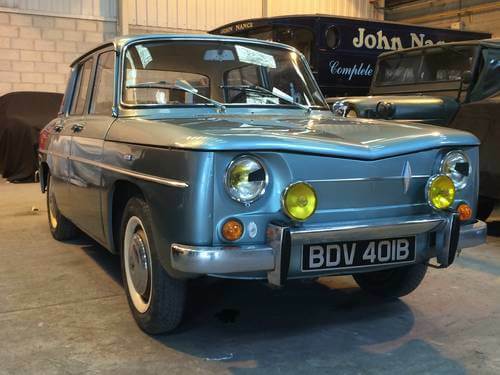 This Renault 8 Gordini is located in St Austell in Cornwall with an asking price of £3,000. Not a genuine Gordini by the look of it. Most production R8’s are kitted out to look like the gord with out much of the guts. I’m not expert (the guys at Aussie Frogs know everything, though), but I own a gord and it is a 5 speed, 1100 cc (1296cc now), with dual weber side draught DCOE’s. Mine is a 1970, so they may have made improvements toward the end of the run, but I would be suspicious of any 4-speed “gordini”. IIRC, the regular R8 gearbox is a bad match for the gord engine since it has less meat in the differential (2 planetary gears instead of 4). If you have questions I can dig deeper or take some photos for ya, but I would suggest tapping the expertise of the Aussie Frog community for proper confirmation…. oh just noticed the plug location; that doesn’t look like a gordini head either. Thanks for the information there! Interesting and useful. Haven’t seen one of these in the flesh, as in a real one so with this it was hard to tell. It can be easy to dress up one and make it look like a Gordini. From what I remember it sold not long after the article went live. Yours sounds cool, especially with the dual Webers. Would love to drive one. If I come across another for sale and plan to feature it, I will check with the Aussie Frog community! Thanks again for the comment and the helpful details!